Mario Cucchetti Tessuti brings together Quality, Care for the Environment, Safety, and Social Responsibility. Quality means we are continuously improving our production processes and our management control systems as well as investing in new technology. We use technologically advanced, modern machinery that is regularly renewed. Care for the Environment means sustainability and thus the need for processes that ensure maintainable growth for the planet. We have installed photovoltaic systems that result in a greater than 50 ton reduction in CO2 emissions per year. Safety concerns both the people in the workplace as well as production processes. That is why we have allocated resources to improving the work environment and renewing the equipment that handles logistics, weaving, and packaging. Our Social Responsibility is expressed towards people, both in our community as well as in society as a whole. We believe that—along with creating economic value for their shareholders—companies should also create social value for their community. 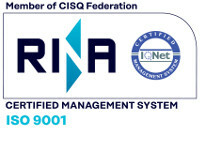 CERTIFICATIONS: ISO 9001, OEKO-TEX and GOTZ.